Long lasting and turnkey, repurposed shipping containers deliver a flexible and mobile ground level office that you can rely on for years to come. Falcon’s climate controlled, conex offices and comfort stations are constructed of sturdy, galvanized steel and include office grade finishes. Multiple floor plans are available to address all of your modular workspace, meeting, and storage needs. Several configurations even include a half bath or full bath upgrade for added comfort and convenience. The open container office configuration provides practical workspace in a safe, climate controlled environment. This turnkey, mobile ground level office solution is flexible, easy to set up, and includes a secure, steel personnel door. Choose from 20-foot and 40-foot floor plans. Like our turnkey, mobile open container office option, the open office with half-bathroom offers practical workspace in a secure, climate controlled space. The pre-plumbed half bathroom for adds comfort and convenience. Choose from 20-foot or 40-foot floor plans. 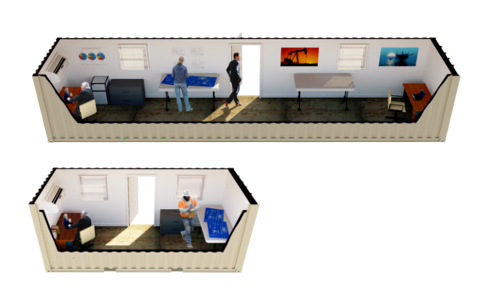 If you need two separate work spaces in one climate controlled, mobile ground level office, consider our 40-foot dual office. Divided by a sturdy, floor-to-ceiling wall, each office is equipped with its own steel, personnel door and HVAC unit to provide both privacy and comfort. Like the 40-foot dual office, the 40-foot dual office with a half-bathroom includes two distinct offices with separate entrances and HVAC units. A shared half bathroom, accessible from both offices, provides added convenience in this turnkey, mobile office configuration. 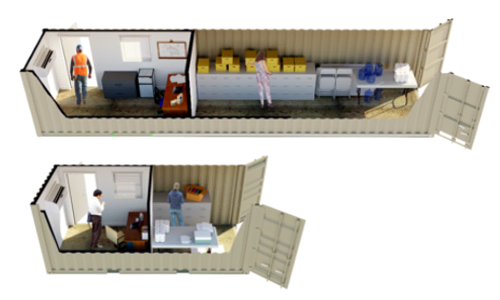 If you need a turnkey, mobile workspace with convenient storage nearby, consider the store and work container office. This floor plan includes separate entrances for each space, which offers both privacy and convenience. If expanded storage and a smaller, climate controlled ground level office fit your needs, choose from 20-foot or 40-foot floor plans. The reverse configuration to our 40-foot store and work container, the work and store configuration offers expanded, climate controlled ground level office space with reduced storage. This floor plan offers separate entrances for each space, which provides both privacy and convenience. Versatile and turnkey, the 40-foot workplace shipping container combines work and conference space under one roof. The floor plan includes three distinct workspaces for privacy, and individual HVAC units ensure comfort from room to room. The conference area easily converts to a break room, file room or reception area based on your needs. Employees who work at remote job sites in extreme weather or with hazardous materials need a comfortable space to take a break, shower, and change clothes. 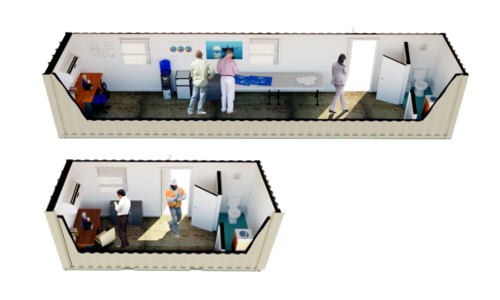 Falcon Structures' climate-controlled locker rooms and comfort stations are built to last, deploy quickly, and enhance employee morale.